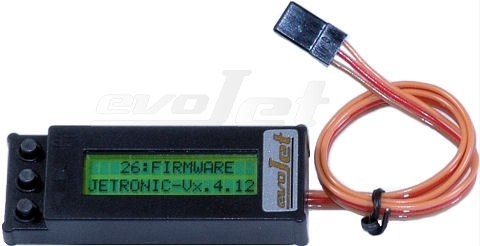 The Onboard micro EDT (Engine Data Terminal) is a handy programming and display unit with a two-lined LCD for all Jetronic controllers. It is small and lightweight and can be permanently stay (e.g. with Velcro tape) in the plane or can also be detached for the flight. The Onboard micro EDT screen displays all useful data and allows quick setup programming at the model. This Product was added to our catalogue on Sunday 29 July, 2012.